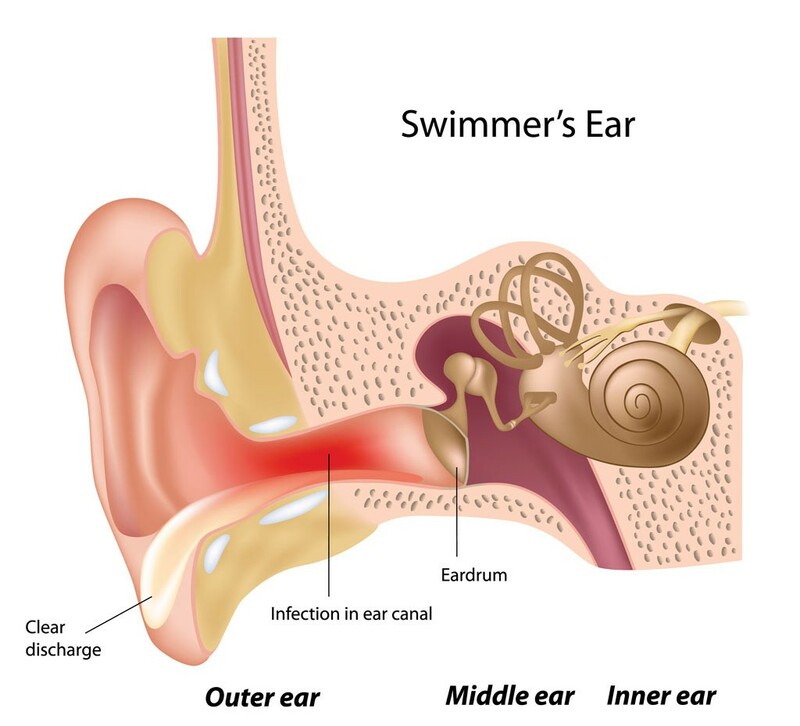 Swimmer’s ear or external otitis, is a skin infection of the ear canal. It is often referred to as “swimmer’s ear”, although most cases occur in the absence of swimming. Acute external otitis is usually quite painful, with pain extending to the upper neck and jaw. Chronic infectious otitis externa is most often caused by a bacterium, although occasionally it can be related to fungus, and is commonly less painful than acute otitis but often produces a blocked feeling in the ear. A third form of external otitis is the chronic itchy ear. Patients with this condition often have years of frequent scratching or manipulating their ear canals. This is most often related to eczema, a skin reaction akin to allergies. Acute otitis externa is most frequently a bacterial infection, arising suddenly and increasing rapidly in severity, becomes very painful. The pain is often described as deep or boring, and can interfere with daily activities or sleep. 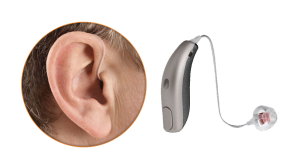 Patients often note temporary hearing loss due to a combination of wax, swelling and pus, blocking sound almost completely. When left untreated, this condition can spread elsewhere to the soft tissues of the face, upper neck, and the jaw joint, creating pain when a patient is chewing. Most people at one point in their life will experience an external otitis. Most cases of external otitis are uncomplicated and easily managed by most primary care providers. It is interesting that the majority of cases of external otitis are related to a bacterium that naturally inhabits the ear canal. The inciting factor is often a break in the skin related a minor trauma to the ear canal. The most common trauma occurs when a patient attempts to clean the ear with tools such as cotton swabs, finger nails or other small implements. Chronic otitis externa is a form of the condition that lasts for a month or more or occurs more than four times in a year. This is most common when a patient suffers from eczema or chronic irritation from the use of hearing aids or regular insertion of cotton swabs. This is also a possible result of regular contact with water that builds up in the ear, causing pressure and increases the likelihood for growth of bacteria. Excessive cleaning: Using external media (cotton swabs) to clean the ears too frequently can irritate the skin in the ear canal and cause infection. Ear wax is a normal protective barrier to bacterial invasion, and constant removal of wax will predispose to external otitis by lowering this defense. When a doctor is examining a patient with ear complaints suspected to be related to external otitis, they will be looking for a red and swollen ear canal. The ear canal may also appear to be shedding skin, similar to eczema symptoms. There is commonly debris in the ear canal, which can be a combination of dead skin, dehydrated pus, and wet wax. Due to swelling and narrowing of the opening to the ear canal, it can sometimes be challenging for doctors to inspect with an otoscope, and may prompt the doctor to make a presumptive diagnosis and call for a follow up examination after a period of treatment. If there is a recurrent or particular severe external otitis, some of the discharge can be collected and sent for a culture to help determine the type of organism that is causing the infection. Some cases of mild swimmer’s ear can be treated with OTC drops or home-made drops that consist of acetic acid (vinegar), and alcohol (rubbing or isopropyl). 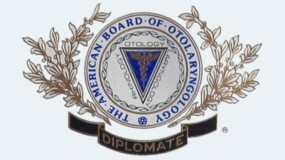 Most often the patient with more significant external otitis will seek medical care, and the examining physician will have to make the call as to whether the infection is moderate and requires only topical medications (antibiotic ear drops), or severe enough to necessitate both oral antibiotics and antibiotic ear drops. Recalcitrant or recurrent cases occasionally require care by an ear, nose, and throat specialist (ENT). These patients are often benefitted by removal of debris from the ear canal, and placement of topical powdered medications such as antibacterial agents, antifungal agents, or steroid powder. Complicated external otitis in a diabetic or immunocompromised individual can be very serious, and often requires a higher level of care. Chronic otitis externa is a form of the condition that lasts for a month or more, or occurs more than four times in a year. This is most common when a patient suffers from eczema, chronic irritation from the use of hearing aids, or regular insertion of cotton swabs. This is also a possible result of regular contact with water. Over the past several decades, there has been a proliferation of bacteria who carry resistance to certain antibiotics, which has made treatment of external otitis more difficult. Occasionally a more chronic otitis externa can result from overgrowth of a fungus, which can be a side effect of treating a bacterial infection with anti-bacterial drops, or oral antibiotics. Patients with diabetes are more prone to getting chronic external otitis due to fungus. When a fungal infection is suspected, treatment with topical antifungal medications or oral antifungal pills is indicated. Removal of fungal debris from the ear canal is also important in the treatment of fungal external otitis. For a full diagnosis and advice on the best course of treatment, especially for severe and painful earaches with several symptoms present, please contact your primary care doctor to make an appointment. If your symptoms are persistent despite treatment, visiting once again with your primary care doctor will allow them to re-treat, or to refer you to a specialist for further care. 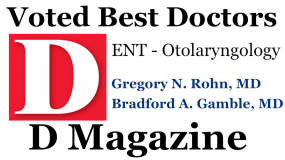 Dr. Rohn and Dr. Gamble are ear, nose, throat, and sinus surgeons with offices located in Plano and Dallas. If you would like to schedule an appointment with our office, please call our Plano office at 972-378-0633 or Dallas office at 214-239-1641.